This workshop is full of fun while learning how to paint dogs and animals from life. 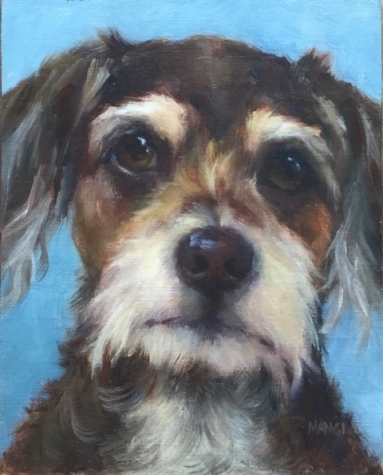 Putney Painter, Johanne Mangi, will share and guide you in her inimitable way in how to capture the incredible spirit of pets and animals. If you are inspired to them, this is the workshop for you. These three days will focus on the beloved canine as Fine Art. We will concentrate on the dog’s underlying gesture as well as its unique personality. Through lively brushwork we will capture our subject’s essence as well as likeness. We will have an opportunity to study a live model to further understand our photo references. Despite the general use of photos, first and foremost, it is from life that we acquire the skill to know what to look for. Expect demos throughout the workshop beginning with a head study and then proceeding to specific parts such as the eye and nose. We will always be mindful of form, values and edges with temperature bringing up the rear. Fur can be challenging but we will tackle that no problem. We will start out with energetic quick sketches to loosen up. Drawing will be primarily about muscle memory and less about exactness. We are headed towards NO FEAR Painting and this is part of the process. Next, we will use a limited palette to keep your mind uncluttered and directed towards the most important aspects. The instructor will provide photo references for this portion of the workshop. Finally, we progress to a full color palette painting from your own reference photo or the instructor’s. All participants will receive one-on-one attention providing you with the confidence you need to work on your own. Please note, although this is considered an intermediate/advanced course painters with basic experience are welcome. If you dream to paint animals or hone your skills to the next level, do not miss this special workshop! To Register: Contact Penelope at <villarts@sover.net> or call 802-246-7742.